The gems and jewellery sector in India, consisting of a large number of small and medium enterprises (SMEs), has started to shine again, according to a survey conducted by IndiaMART Knowledge Services (previously known as IndiaMART Research Unit). The survey was conducted to ascertain if the recovery in the global markets is benefiting SMEs in the gems and jewellery sector too. Around half of the respondents found the market in 2010 better than in 2009. About 27.1 per cent saw the market drop further in 2010, and the remaining 22.9 per cent reported no change in the market scenario. Consumer sentiment did not reflect greater change: only 16.7 per cent of respondents said that it had risen beyond expectations. Half, however, found only an average increase in consumer sentiment. About 33.3 per cent continued to find it negative in 2010. 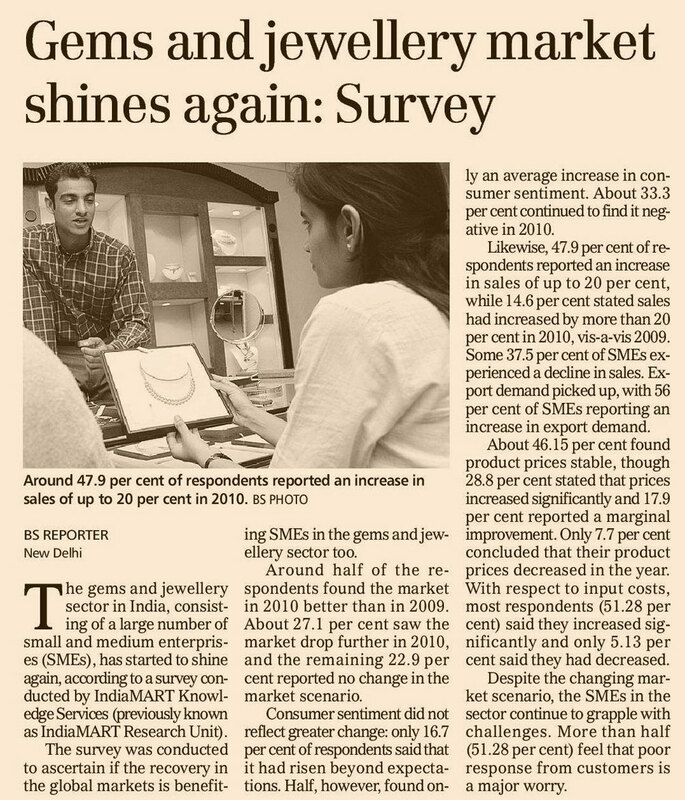 Likewise, 47.9 per cent of respondents reported an increase in sales of up to 20 per cent, while 14.6 per cent stated sales had increased by more than 20 per cent in 2010, vis-a-vis 2009. Some 37.5 per cent of SMEs experienced a decline in sales. Export demand picked up, with 56 per cent of SMEs reporting an increase in export demand. About 46.15 per cent found product prices stable, though 28.8 per cent stated that prices increased significantly and 17.9 per cent reported a marginal improvement. Only 7.7 per cent concluded that their product prices decreased in the year. With respect to input costs, most respondents (51.28 per cent) said they increased significantly and only 5.13 per cent said they had decreased. Despite the changing market scenario, the SMEs in the sector continue to grapple with challenges. More than half (51.28 per cent) feel that poor response from customers is a major worry.